1.) I was in need of a rain/snow jacket, and I got the last white Columbia in my size. I'm in love with my new jacket, and at 50% off, I love it even more. Oh! It also has fleece lining that zips out, so it's like two jackets in one. 2.) My "New Year's Eve" dress. 3.) These Kiss Nail Dress decals are so unlike me, but they are so fun and festive. 4.) I got my first pair of real boots (found at DSW). I've only ever gotten cute-but-cheap boots for $40 tops. Thanks to a rewards member coupon, these beauties are mine! 5.) My hair had a good frizz-free curl week. If you had to deal with these tresses daily, you'd be thankful too. Yikes. 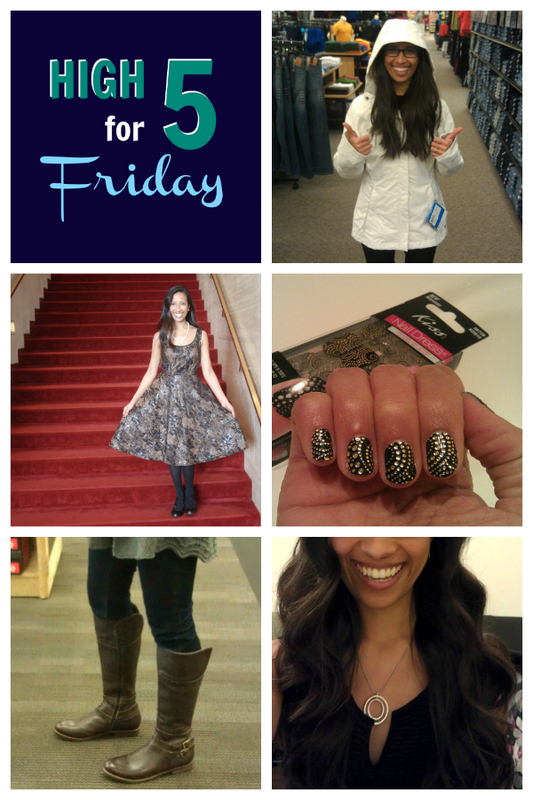 This week's highlights make me look really superficial! Oh, well. There's nothing wrong with pretty things, right? :) Happy Friday, friends! I've been wanting to try those nail things...are they a pain to take off? OR do yu still have them on? Haha! And those boots...mmm, girl. YES. Just yes! Yes yes pretty things are great!!! I Am obsessed with those boots LOVEEEEEEE. Loving those nails and your new coat is supercute! I have a hot & cold relationship with my curls too lol. You're hair looks fantastic! And I absolutely love your NYE dress - so pretty! Love those boots, they are so cute! Those nails are the businessss!!! I love how they're fancy and you didn't even go to the nail shop for em!! And you've been having some great hurrr days friend!!! Lucky duck! you're flipping BEAUTIFUL. lordy. i love that coat, the dress, and the nails! If it makes you feel better, superficiality boosts the economy, so you were actually doing a patriotic thing. :) Silver lining, check. I love that the majority of your "Five" are catching GREAT bargains- that is definitely a high five!! I think we all need a post or two that is a little but superficial! Look at you, miss fashionista! I love all of it! That coat is amazing. But so are the boots. And you know I'm in love with that dress! You're just too adorable! I love those boots! Very cute boots! I love em. :) And that Columbia jacket is great too! OBSESSED with those boots! They are so stinking cute! What cute boots! I'm seriously in love with your hair. One day mine will be that long again!